GRAFENWOEHR, Germany — The U.S. Army installations at Grafenwoehr, Vilseck and Hohenfels will upgrade to a new phone system beginning this year, prompting changes in hardware and office phone numbers. The old dial tone switches ran out of service warranty and it’s time to switch to the new Internet Protocol technology, said James Nejelski of U.S. Army Network Enterprise Technology Command, or NETCOM. Office numbers at USAG Bavaria will gradually change over the course of the next year. All current telephone numbers connected to the switch — including barrack numbers — will change. Phone numbers at the housing areas, however, will not change. These numbers are privately connected to the local Deutsche Telecom network. 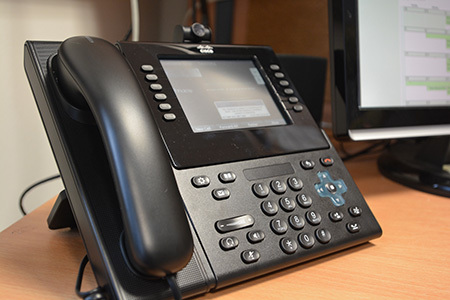 The new system provides more features with the ability to host telephone conferences. Every phone will be equipped with voice mail and some with camera and screen for video calls, said John Sholes, the garrison’s information management officer. 5th Signal, the Army’s unit responsible for network service in Europe, will upgrade all users step-by-step, depending on who is on the same interface card at the switch — this means by facility or small groups. All hardware and setup service will be provided by the U.S. Army Network Command and 5th Signal Command. The upgrade requires new phone numbers. Once a device is updated with the new phone number, the old number will be forwarded for 45 days. This major project will be finished on Tower Barracks in Grafenwoehr, Rose Barracks in Vilseck and at the installation in Hohenfels between 2016 – 2017. The USAG Bavaria Public Affairs Office manages the garrison website at www.bavaria.army.mil, and aims to publish updated phone numbers promptly in the phone book at www.bavaria.army.mil/phonebook.